Kim Kardashian and Kanye West officially tied the knot this past weekend in Italy. 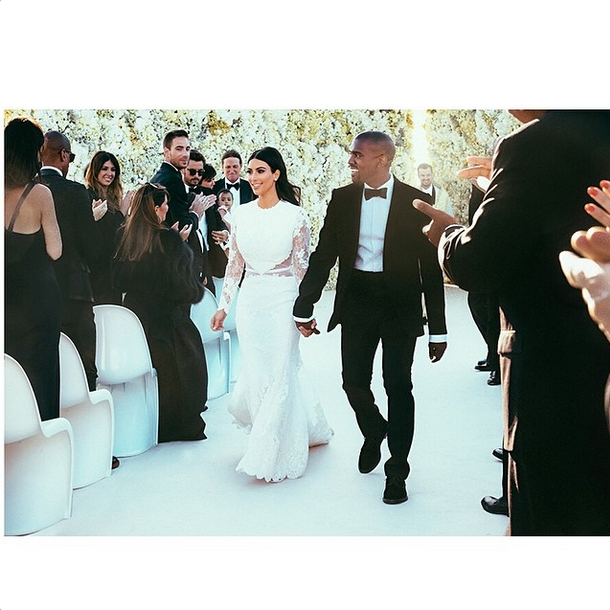 If you don’t follow Kim’s Instagram page, you may have missed the wedding photos that she shared with her fans. The couple was married on May 24th in Florence, Italy, at Forte di Belvedere, which dates back to the 16th century. 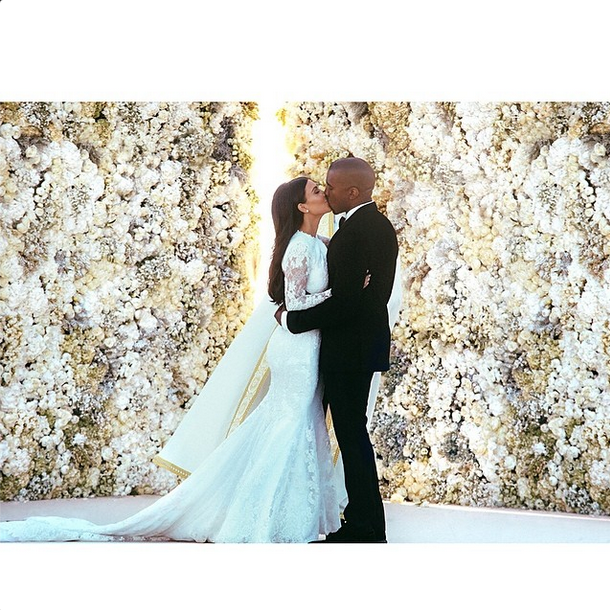 The couple wed in an outdoor ceremony in front of multiple walls of flowers, which may have been inspired by Kardashian’s Mother’s Day gift. A long list of celebrities was in attendance to see Kim get walked down the aisle by step-father Bruce Jenner while being serenaded by famed Italian singer Andrea Bocelli. John Legend, Chrissy Teigen, LaLa Anthony, Jaden Smith, multiple members of the Kardashian-Jenner clan, and more were present. It is reported that Kim, Kanye, and baby North all donned custom Givenchy for the lavish affair. John Legend performed for the couple during their reception. The wedding had a lot of hype to live up to, especially since their pre-wedding dinner was held at the Palace of Versailles in France. Sultry songstress Lana Del Rey performed at their pre-wedding dinner and magician David Blaine entertained the guests for the evening. Kim and Kanye were first spotted together in April 2012, which sparked rumors about their relationship. The couple had their first child in June 2013, several months before West proposed to Kim in October at AT&T Park in San Francisco in front of Kim’s family and friends. He presented her with a 15 carat cushion cut engagement ring with a pave band. This is the first marriage for West and the third for Kardashian. Kardashian was married to music producer Damon Thomas from 2000 until 2003 and NBA player Kris Humphries for 72 days in 2011.